In my last post, I summarized a talk, Slowing Down, that I had facilitated recently at Agile Open Northwest. There was a fair amount of interest in the topic and some folks mentioned that I should do a follow on session focused on specific things we could do to start slowing down. It was a call to action. Once again, I walked into the session with very little idea of what would happen and how it would all work out. Stop reading everything related to the next meeting’s topic. Be prepared to be unprepared. Obviously we captured a lot of “stuff” here. Some of it I really like, and other things I will probably never try. I’m committed to trying many of them. I’m still absorbing, so for now I’ll take it one day at a time. Once again, I’m grateful to those who participated in the session. 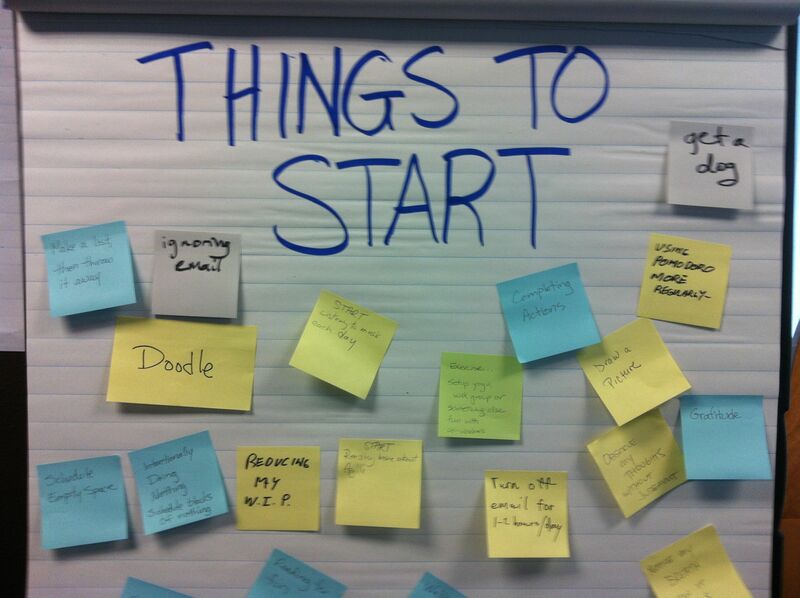 I hope some of these ideas serve as a starting point for others in the same fashion they have for me. 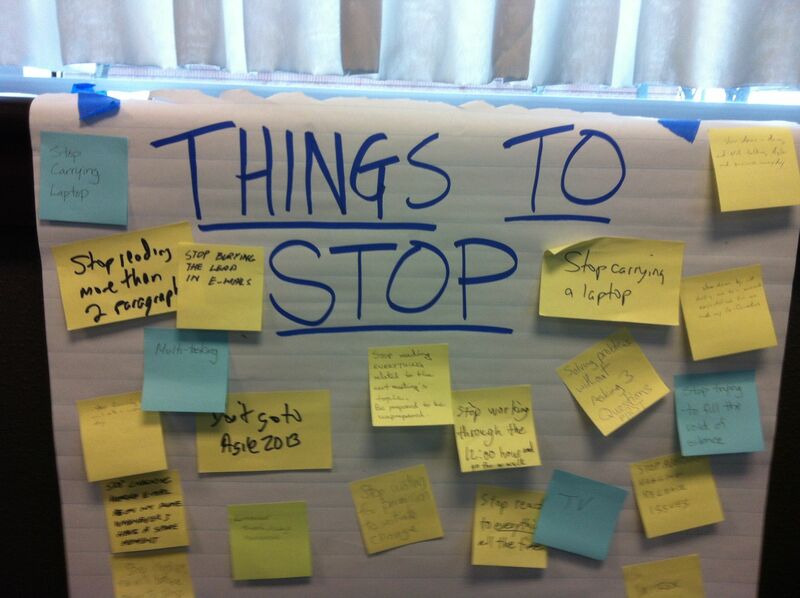 Last week I led a session at Agile Open Northwest called, “Slowing Down”. The idea for this session was inspired by my own struggles with becoming quite over-committed to a variety of things (my job, my hobbies, etc.) and the resulting stress and crisis it has created for me. You see, the funny thing about it all was that even though I was perfectly aware of what I was doing by over-committing like crazy, I couldn’t seem to stop. Fortunately for me, many in the audience had a similar story. Since we are a bunch of software development types, it didn’t take long for the concept of sustainable pace to be mentioned. Of course we all knew full well what sustainable pace means. It is a term that I originally encountered in Xtreme Programming. I could ramble on for hours about the importance of keeping the pace and duration of your work under control so that you can sustain your creative energy and not burn out. Easy. But I can’t seem to do it worth a damn. That’s the interesting bit. Why? Why is it that, even knowing the importance of maintaining a sustainable pace, I and others like me seem to struggle so hard with it? Ownership – Feelings of ownership can make it hard for people to let go of tasks and delegate them to others. For example, it is very easy for project leaders to feel a very strong sense of ownership and commitment to the success of projects that they are working on. This can be quite normal – often our organization want this kind of commitment from us. However, like many things, this can go too far. The undesired dynamic plays out as a feeling that you and only you are personally responsible for the success or failure of the project (what happened to the team?). When challenged, people who struggle with ownership issues will often look with incomprehension when asked to give up some part of a project, “If I don’t do it, who will?” I think that in some cases this inability to give up ownership can also manifest as heroism (ownership + adrenaline junkie). 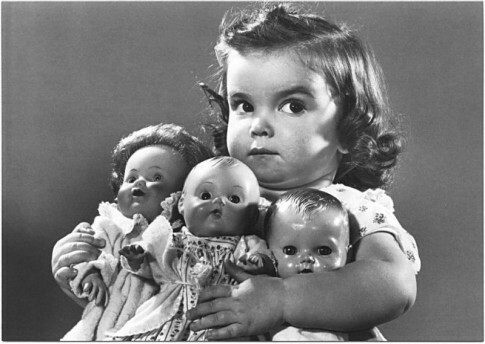 Perhaps at its heart, ownership issues are tightly tied to ego. They seem to manifest as a very selfish view of project success or failure. 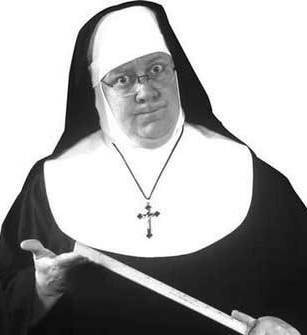 Habit – We form all sorts of bad habits that contribute to the stress in our lives. For example, I’ve gotten into the habit of checking my email compulsively throughout the day. Often even when at home. Habits like this that tether us to the office and constant communication serve to raise our overall stress levels. Other examples include habitually taking home the laptop with you every night and carrying the work phone with you wherever you go. Culture – One major reason for difficulty with slowing down is the work culture you live in. People shared many different stories of how the expectations at work made it hard or almost impossible for them to escape the pressures of the office. Everything from evil bosses that demand attendance over performance to co-workers who make snide comments when a colleague dares to leave the office at 5:00. Some places even provide rewards for those who make decisions that put work above any other activity. Examples of these sorts of influences in the workplace abound. All of these influences are very common reasons why people find it hard to slow down. It is no wonder that there are many who struggle to maintain a sustainable pace of work at the office. Understanding why you are feeling that pressure is critical to understanding what strategies to use to manage the problem. The strategies where where we ended up going next. As we moved along in our discussion, people identified strategies that could be used to deal with slowing down and establishing a more sustainable pace. We captured and expanded upon those strategies as we wove the narrative of slowing down. The first strategy that came up was setting boundaries. Setting boundaries is fundamental to establishing control over your own schedule and pace. Fail to do this and all the rest really doesn’t matter. People told many stories about how they managed to establish meaningful boundaries in their work lives that helped them to keep a meaningful sustainable pace. Some made their 9 to 5 work hours non-negotiable. They never offered the longer hours that many fall into. You get me for 8 hours a day, and the rest of my life is not for sale. It was remarkable to hear the strength of some of these voices. Others refused to take work home or turned off the cell phone after 5. Basically, what I heard were people establishing a service level agreement for their participation. One benefit that I noticed from this sort of boundary was that it made visible to everyone just what they could and could not expect from you. Visibility is a strongly held value in the agile community and it struck me that making my boundaries more visible would be a uniquely agile way of dealing with the issue (I’m closing the door now…). Another way of making my boundaries and limits visible would be to use a personal task board mechanism like personal kanban in order to not only make my existing commitments visible, but also to review them myself and keep tabs on how the work load is balanced (or not). Diana Larsen did a great session last year at Agile2012 on personal retrospectives. As team facilitators, we are pretty well versed in running team retrospectives, however I never do them by myself. That is exactly what Diana proposed: do self-retrospectives on a periodic basis in order to reflect on your progress toward your goals, and where you want to go next. I think this would be a useful tool for many, whether it is only at the end of the year or much more frequently. I know that my own responsibilities feel like they have changed quite dramatically in the last year. Stopping to assess those changes might just give you the opportunity to recognize stressful trends and start to do something about it. You can start to do it now, or wait until a crisis imposes that reflection. Your call. This is just my summary of what I saw and heard during our talk. Looking at the sheer number of topics that we covered it’s quite apparent to me that we covered a broad number of subjects. Many of them are worthy of deep investigation. 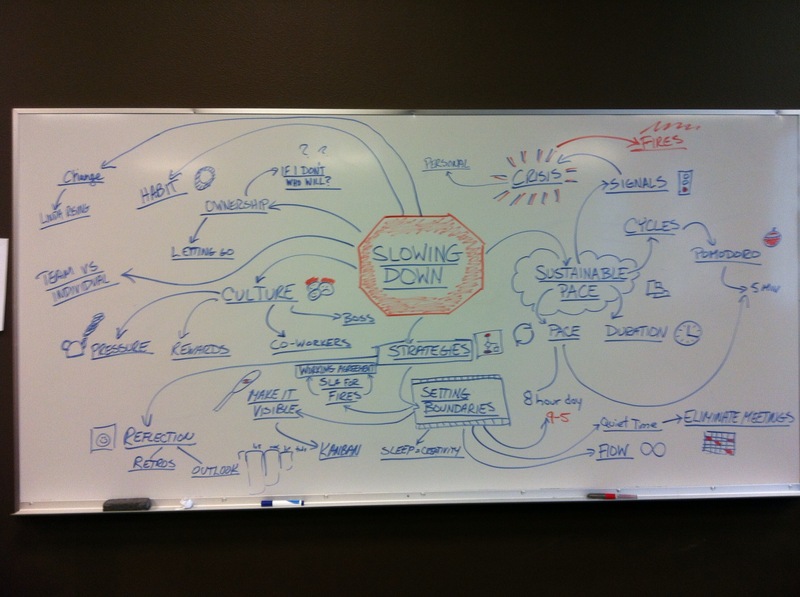 Perhaps, as the mind map suggests, we have created a map of the terrain of the topic of slowing down. Others may have different take aways. I certainly hope so. I appreciated everything that the group brought to the conversation and I hope that I was able to serve as a reasonable scribe for what was said. You are currently browsing the Agile Tools blog archives for February, 2013. Buy it now at Leanpub!